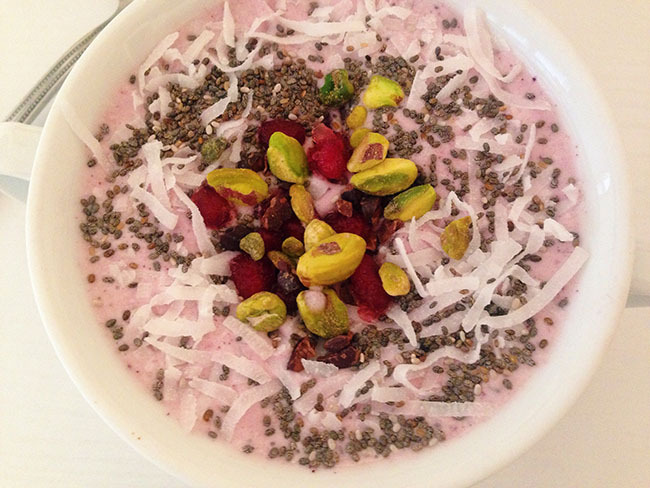 This past Sunday I recreated "Super Bowl Sunday" with this super nutritious and delicious smoothie bowl! With warmer temps I've been swapping my oatmeal for cold smoothies or yogurt and granola. I love smoothies, but although they are packed with tons of nutritious yummies, I often feel hungry five seconds later because I slurp them down so fast. I learned a tip from my sister to pour your smoothie into a bowl and eat it with a spoon. This causes me to slow down and realize I'm actually getting full, and it's an excuse to top it with more goodies like granola, more fruit and nuts! I created this super bowl recipe based off a picture I saw. The ingredient list is short and doesn't call for outlandish things like bee pollen and hemp milk. Not all of us smoothie drinkers are hippies. Blend 'er all up until smooth, divide between bowls and decorate with toppings. Pro tip* eat one serving and pour the other half in a mason jar. Freeze and eat later in the week. You can pop your frozen smoothie in the microwave for about three, 30 second intervals to get it back to normal or let it sit out on the counter, go do your morning workout and when you come back breakfast is ready! It's now Tuesday and I'm finishing off my smoothie bowl leftovers! Has anyone else ever tried eating their smoothies in a bowl?